Water conditioning treats four general problems: hardness, iron, acidity, sediment. 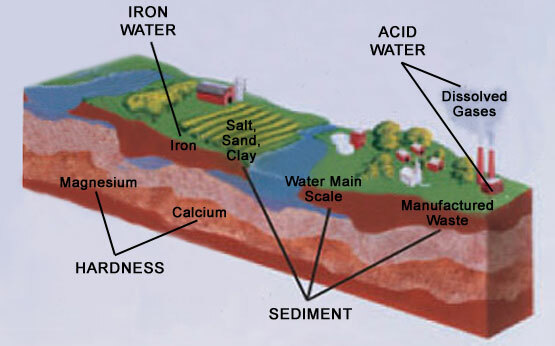 Hardness is a term to describe the presence of calcium and magnesium minerals in water. A glass of hard water is a glass of dissolved rocks. You can’t see the hardness in the water until the water evaporates. What once was invisible is now seen on everything the water touched- clothes, dishes, food, hair and skin: Film or spots on glassware Ring around the bathtub No soap suds Dingy clothes wear out quickly Scale formation on plumbing Loss of water heating efficiency As you can see, the major disadvantages are both aesthetic and economical. Hard water affects living in general. Hardness minerals combine with soap to make a soap curd. The curd greatly reduces the cleaning action of soap. Precipitated hardness minerals form a crust on cooking utensils, appliances, and plumbing fixtures. Even the tastes of foods are affected. A water softener removes the hardness minerals to eliminate these problems, and others. Water softening has been used routinely since the 1950s in both commercial and residential application. Today, it is estimated that over 10 million households have operating water softeners. Iron in water causes stains on clothing and plumbing fixtures. It negatively affects the taste of food, drinking water, and other beverages. Four different types of iron in water are: Ferrous (clear water), Ferric (red water), Bacterial and organically bound iron, Colloidal and inorganically bound iron (ferrous or ferric). Water may contain one or more of the four types of iron and any combination of these. Total iron is the sum of the contents. Ferrous (clear water) Iron is soluble and dissolves in water. It is usually detected by taking a sample of water in a clear bottle or glass. Immediately after taking, the sample is clear. As the water sample stands, it gradually clouds and turns slightly yellow or brown as air oxidizes the iron. This usually occurs in 15 to 30 minutes. A water softener will remove moderate amounts of this type of iron. Ferric (red water) Iron, and Bacterial and Organically Bound Irons are insoluble. This iron is visible immediately when drawn from a faucet because it has oxidized before reaching the home. It appears as small cloudy yellow, orange, or reddish suspended particles. After the water stands for a period of time, the particles settle to the bottom of the container. Generally these irons are removed from water by filtration. Chlorination is also recommended for bacterial iron. Colloidal and Inorganically Bound iron is of ferric or ferrous form that will not filter or exchange out of water. In some instances, treatment may improve colloidal iron water, but always consult a qualified water chemistry lab before attempting to treat it. Colloidal iron water usually has a yellow appearance when drawn. After standing for several hours, the color persists and the iron does not settle, but remains suspended in the water. All water, when chemically analyzed, is either acid, neutral or base (alkaline). To measure this, the water is given a pH value between 0 and 14. Water having a pH from 0 to 6.9 is acid. A pH of 7 is neutral. Above 7, the water is alkaline Acid water is caused by carbon dioxide, hydrogen sulfide, and sometimes industrial wastes. Although sometimes clear in appearance, it causes green or blue stains on plumbing fixtrures and may etch porcelain and enamel over a period of time. It is corrosive to water heaters and other water using appliances, shortens the life of iron pipe, corrodes copper and brass pipe and fittings and can also damage and cause premature failure of seals, diaphragms, etc., in water handling equipment. A chemical analysis is needed to measure the degree of acidity in water. This is called the pH of water. Water testing below 6.9 pH is acidic. The lower the pH reading, the greater the acidity. A neutralizer filter or a chemical feed pump are usually recommended to treat acid water. Sediment is fine, foreign material particles suspended in water. This material is most often clay or silt. Extreme amounts of sediment may give the water a cloudy appearance. A sediment filter normally corrects this condition.